Hibernian head coach Alan Stubbs insists it would take "lots of money" before the club would even consider an offer for striker Jason Cummings. Cummings, 20, netted the only goal as Hibs beat Raith Rovers - the forward's 16th goal of the season. The win kept Stubbs' side three points off Championship leaders Rangers. "We're not even thinking about it to be honest," replied Stubbs when asked about holding on to the Scotland Under-21 international. "We've said that we don't anticipate any players leaving that we don't want in January and I've got to say it would have to be a very significant amount of money if we even consider it. "And that's not to say I am before anyone says. "We are very relaxed with the situation. He's doing really, he's scoring goals and when you've got a striker and that's happening then people have to pay lots of money, if we did even consider thinking about that." 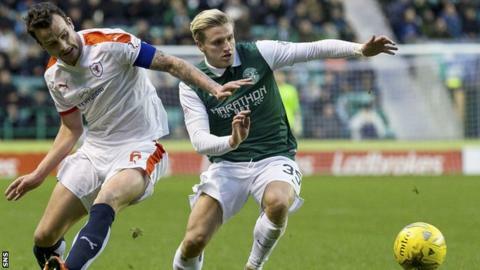 Stubbs admitted Cummings had not been at his best against Raith but told BBC Radio Scotland's Sportsound: "He's a real threat, he's learning all the time. "He's really improving. He's got an opportunity to be very good." On maintaining Hibs' title challenge, Stubbs added: "We keep doing what we've done all season - winning games of football. "We were unbeaten in 17 games before the Rangers game [Monday's 4-2 defeat]."